VW Pet Shop is a WordPress theme presented by VowelWeb for designing a website or a blog related to Pets. This theme can be used for almost all the businesses related to animal care or shops. 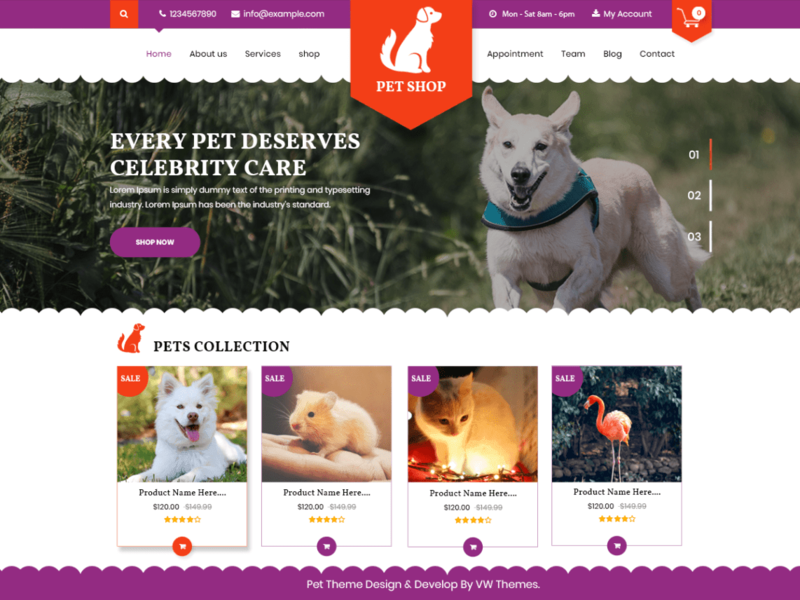 The theme can be used by pet shops, animal care, veterinary doctors, pet groomers, pet and animal bloggers, pet consultant, pet spa, animal accessories shop etc. It has a simple and interactive design which enables the user to seek the right solution to their problem without any hassle. It has personalised option to use it according to your need. Clean and secure codes are implemented using shortcodes. It is loaded with awesome features still it is a light-weight theme which loads fast. These all things contribute to making it a search engine optimized theme to get your site a higher place in search engines. This animal WordPress theme is responsive, cross-browser compatible, translation ready and has call to action button (CTA). Its social media icons will widen the reach of your site and its content and will help increase the influx of visitors to your site. It has a beautiful design to make your site stand apart from your competitors. These features combined make it an ideal pet WordPress theme.